Is your internet service provider charging you a monthly fee for using their WiFi router? Not only is this costing you extra, but it may not be giving you a great WiFi signal and may not be secure. Even if your conventional router is password-protected, cybercriminals could access devices connected to your WiFi network and steal personal information. Norton has introduced a router with this in mind. In my opinion, this is the direction all routers should be taking. The Norton Core Secure WiFi Router is not just a router, but it’s the first line of defense against an attack on your home by cybercriminals. (It’s not too bad to look at either!) This article is an in depth look at this new product. Read on for the full Norton Core review. Note: This post was sponsored by Symantec and the router was provided to me at no charge for review purposes. However, all opinions expressed and observations made about the product are my own. This post may also contain affiliate links. Any good cyber security expert is going to tell you that you shouldn’t give out your WiFi password to everyone that enters your home. While I tend to be a trusting person and don’t think my kid’s friend is going to hack into my home network, I also believe in the saying, “better safe than sorry”. So, to keep my guests happy, and keep my home safe, I think a private WiFi connection for my guests is the way to go. The Norton Core allows me to create guest WiFi networks with their own unique names and passwords. In addition, I can set time limits to these networks. So, when the plumber leaves, he no longer has access to our WiFi. Not long ago hackers took down over 80 major internet sites like Twitter and Amazon. How did they do it? They hacked into devices inside people’s homes and turned them into little soldiers in their attack. They took control of tens of millions of these devices and had them all contact one domain name system provider in New Hampshire at around the same time. The system became overloaded and ultimately failed to keep up with requests. The result was a massive internet interruption for millions of users. Your home could have been used in the attack without you even realizing it! What’s worse is that if people can hack their way into devices in your home, they may be able to hack into your entire home network. Once in your network, they can steal personal information or block access to your computers and devices until you pay a ransom (this new type of malware is called ransomware). We all need to start protecting ourselves from this type of attack. When you purchase a new computer, one of the first things you do is install an anti-virus program and ensure you have adequate malware protection. So why is it that we continue to bring more and more devices into our homes and don’t think twice about how to protect them?! Norton has been thinking about this growing problem and created a device that protects all the devices in your home. When you purchase the Norton Core you don’t just get a router. You also get malware protection for your computers and protection for every device connected to your home network! Our discussion on the dangers of our new connected world may have you saying, “That’s it, I’m going off the grid…cutting myself off from technology!”. While that would protect you from these dangers, it’s probably not practical, or desirable, for any of us. What we’re suggesting is that we have to be more conscious of the dangers and make sure we’re protecting ourselves from them. But how do you know if you’re doing a good job protecting yourself from hackers? 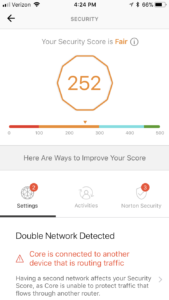 The Norton Core will evaluate your network and give you a security score! They’ll tell you how good a job you’re doing in protecting your home and offer you suggestions for improving your home’s protection. How’s that for peace of mind? If you’re a parent you’re also aware of the potential dangers of allowing your children access to the internet. Not only do you have to worry about your children seeing inappropriate content or meeting an online predator, but you’re probably thinking about the effects too much “screen time” may have on them. The Norton Core helps you manage your kids’ screen time and set content filters with parental controls. 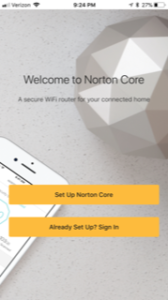 With the Norton Core’s mobile app1 you can monitor and control your home WiFi network from anywhere. See what devices are connected to your network, turn off access to specific devices or individuals, check your security score and even pause the internet connection. Now that we’ve gone over the basics, let’s take a look at the Norton Core Secure WiFi router in action! Setting up the Norton Core router is easy. There’s no strange numbers to type into your browser like with typical routers you purchase. You simply get the app1 on your phone, tell it you want to setup your new Norton Core and follow the steps on the app1. At the beginning answer a few easy questions and agree to the terms and conditions. You will be asked to select the image that represents your current setup. Do you have a separate modem and router (two boxes) or are they combined in one unit (only one box). Tap on the one you currently have and press next. The app will instruct you to remove all the cables from your current modem and unplug it. As you finish each step, simply click next. If you want to check the last step just tap the back arrow at the top of the screen. The app will ask you to take the ethernet cable that came with the Norton Core and plug one end into the Core in the slot with the blue Core logo. Then plug the other end into the port on the back of your modem that says LAN. Plug your modem back into power. Plug the power cord into the Norton Core and plug that into power as well. The app will show you some tips and tricks on your new device as it sets up the Core. You’ll know the Core is setting up properly when you see the white blinking light at the base of the unit. When the app is finished setting up your unit it will ask you to click next to continue. Now it’s time to set up your Norton account. On the next screen either sign in to an existing account or click create an account if you don’t have an account. Follow the steps on the next few screens to create a Norton account and password. Next create a name and password for your WiFi connection. This will be the name of the network you will see when you connect to the internet on your other devices. When you press next Norton will set up your device and network and give you a success message when it’s done. That’s it! You just set up your new WiFi router. On each device that you want connected to your network go to the network settings. Find the Norton Core network by looking for the network ID name you created in step 4j above. Enter your password you created in step 4j above and connect to the network. Congratulations! You now have a new, faster, more secure network! When I first received the Core I was excited about the possibility of placing it near the center of my home to get better signal strength throughout the house. However, I have several things connected directly to my router (ie: printer, smart hub). So, unless I was prepared to run wires down into the basement and over to the other room, moving the router would mean moving all those uglier components as well. I wasn’t prepared to do this so the router remains in my office. I can, however, proudly display it on the desk instead of hiding it in an enclosed desk, so I expect a signal boost for that move alone. In the future, if I get the ambition to run new wires, I hope to relocate the Core to the center of my home. To evaluate the speed of the Core I used an independent speed test. It’s a tool you can use online or through an app to measure the speed of your network. 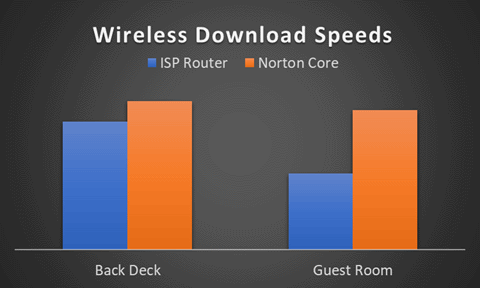 I used this test to measure the speed of my wireless internet connection when connected to my old router and when I was connected to the Norton Core router. I tested these speeds on several devices (ie: iPhone, laptop, etc) and in several areas around my home. After looking at the test results I realized a few things. First, I need to contact my internet service provider to discuss my current speeds. The speeds coming in to my house are abysmal! Second, I learned which areas of my house get good signal and which do not. In the areas that get good signal I’m getting speeds similar to what’s coming in from my internet provider. We get significantly reduced wireless speeds in the bad areas of my house. However, these are the areas where I saw a huge improvement in speeds by using the Norton Core router. In fact, the Norton Core brought slow areas in my home all the way back up to the maximum speeds I saw anywhere in the house. For example, my internet barely functioned in the guest room prior to the Core. It was a deadspot. After connecting to the Norton Core WiFi, my internet speeds were comparable to the speed I get sitting right next to the router! Note: This graph shows actual download speeds using my original (ISP provided) router and download speeds utilizing the Norton Core router in two areas of my home at approximately the same time. All speeds were measured using the tool provided by speedtest.net. These are the results I obtained on my home network. The download speeds you experience will depend upon many variables so your results may vary. I love how easy it is to set up a guest wireless network in my home. It allows me to give the password to a babysitter or visitor without worrying about them having long term access to our network. While I could also do this on the router provided to us by our internet service provider it was much more difficult. I would have had to log into the router online and create the user. If I wanted to turn it off, I’d have to do the same thing. Now I can turn it on and off from anywhere. In addition, I can give admin access to others in my family so they can download the app1 to create and control these guest networks as well. The parental controls offered by the Norton Core are pretty robust. I created a profile for each child in my home. 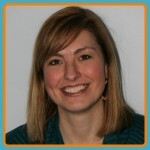 In the profile I set their age, determined which types of content should be blocked, set time limits and set bedtimes. I’m so happy to have more protection over what content they can access online. By enabling notifications in the Core app I’ll be notified if they reach their time limit or try to access restricted content. After turning on the parental controls I tested some explicit websites and content on my child’s device. I was happy to see a large warning pop up notifying me that a site had been blocked by Norton Core for inappropriate content. Getting a little sneakier I was able to circumvent the content restriction and access inappropriate content on some other sites. 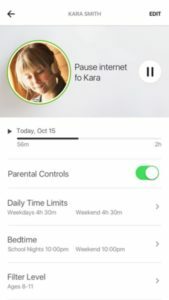 While Norton has made a great start to helping parents with the parental controls, I anticipate that future software updates will continue to enhance the protection. That being said, I know that, regardless of strong parental controls, it’s my job as a parent to keep my kids out of harm’s way – even online. The Core is helping me do just that. After setting up the Core I wanted to dig into the extra protection that this router offers for my home network. Right off the bat my security score wasn’t great. But, by following the app’s recommendations, I was able to improve my score, and, my peace of mind. I’m a gadget girl and have been having fun adding more connected devices to my home. We have a connected thermostat, camera, light switches, motion sensors, smart light bulbs and other outlet controls. As I install each device I create a unique username and password (if possible) to make sure the device is secure. But, I like having that extra level of protection provided by the Core router. I’m really pleased with how easy it is to use the Norton Core app1. I can open the app1 from anywhere, see what devices are connected, what kind of speeds I’m getting from my internet service provider and check on my kids’ internet usage. If someone’s trying to stream a movie I can open the app1 and give priority to their device to ensure they enjoy the best connection available. If you’re only allowed a certain amount of data by your internet provider I think you’ll really enjoy being able to see the total data used on your network. The app1 breaks it down by device and user as well. Norton has made the Core so easy to setup and use that you don’t have to be a techie to enjoy its benefits. However, if you are technical and want to adjust the router settings, you can do it all through the app1. 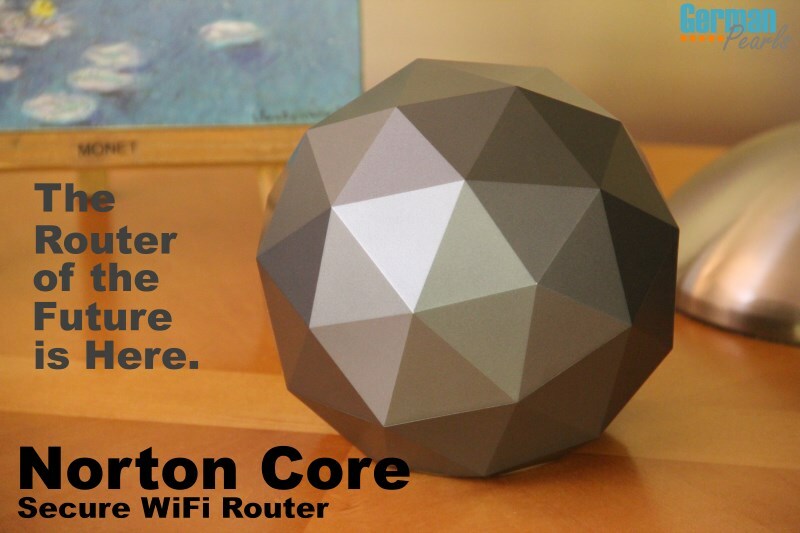 At first glance, the Norton Core looks like an attractive router that will help you boost your home’s WiFi speeds. Upon closer inspection we see it’s much more. The Norton Core WiFi router secures your home and digital life. Technology is evolving quickly. 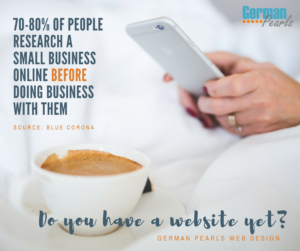 New gadgets and software emerging on an almost daily basis. With the Norton Core Secure Router you won’t have to worry about the security of each device as you bring it into your home. Let Norton handle your home’s digital security. They’ll protect each device and alert you of potential threats or vulnerabilities. The fast seamless WiFi you’ll enjoy is just the icing on the cake! Please note that the Norton app requires a mobile data plan or an internet connection. Subscription renewal is required for security and parental control features after complementary term. Please review complete terms during setup. Thanks for sharing this post with us. I am little bit interested to get more information about WIFI Router. I like to share my opinion on WIFI Router.Nevertheless, Fashionable WiFi routers too broadcast in dissimilar frequencies; similar to 2.Four GHz and 5 GHz. In easy phrases, 2.Four GHz is much significantly better for larger properties and with a number of flooring, because the sign travels farther and simply penetrates by means of/partitions partitions. In any other case for smaller properties or rooms, 5 GHz is one of the simplest ways to go because it provides sooner speeds, although in a shorter vary. Great points Adam, thank you for sharing.